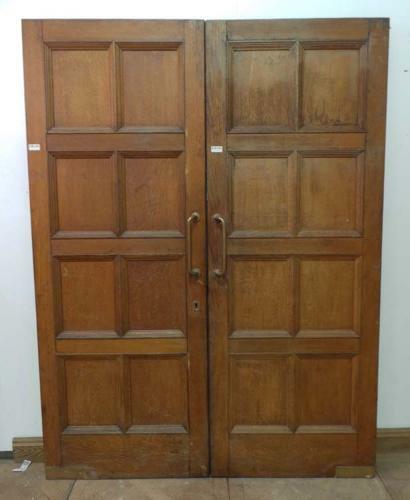 This lovely pair of Edwardian solid oak doors are fully mortised and tenoned. Each door has eight panels fitted with decorative mouldings to both faces. Please note: Individual doors are 32.25 inches (820mm) width each. These measurements are taken without the rebate. All other measurements are taken as a pair. The doors are in good condition, and are fitted with the original brass shoes to the base and brass pulls. There are some mouldings missing to one face, but it would be possible to glaze the top panels, and repair the bottom to suit. The doors are un-rebated, and have a rounded edge.